One of the best things about business degrees is the flexibility. Don’t want to spend a lot of time in school and compile a ton of debt? An associate’s degree gets you into the work force quickly and offers a fair amount of opportunities. Looking to go the traditional four-year route? Many more options are now available to you. Pushing through to get a coveted master’s of business administration (MBA)? The options multiply and can lead to many jobs with six-figure incomes, not to mention a potential starting point toward an executive office. Another good aspect of a business degree is the number of specialization options, which can play to your individual strengths. For example, those who are good at math and are well-organized might be interested in accounting. People with a flair for leadership and a wealth of ideas might prefer management. And those with a persuasive nature might think about sales or marketing. Let’s take a look at some options for those with different education levels. For those with a two-year degree in business administration, a career as a human resources assistant is within reach. As an HR assistant, duties include maintaining employee records and keeping track of benefits. An HR assistant earned a median salary of $38,340 in 2012, according to the U.S. Bureau of Labor Statistics (BLS). Data wasn’t available for HR assistants, but the BLS expected 12% growth for HR managers between 2012 and 2022, so similar increases can be expected. Meantime, an associate’s degree in accounting can lead to a job as a bookkeeping clerk. Typical responsibilities might include maintaining accounting records, working with accounts payable and possibly overseeing an entire company’s books. A bookkeeping clerk earned a median salary of $35,170 in 2012, according to the BLS, which estimates 12% job growth in the field between 2012 and 2022. Moving up to the bachelor’s degree level, senior financial analyst is a common mid-career position, with job duties including the analysis of data tied to a company’s investment programs. A senior financial analyst earned a median salary of $76,950 in 2012, according to the BLS. Job growth of 16% – slightly above average – is expected by 2022. Another job at the bachelor’s degree level is the senior accountant, a position that involves analyzing financial data to determine profit, loss and liability. 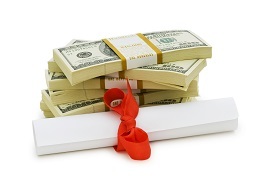 Senior accountants earned a median salary of $63,550 in 2012, according to the BLS. The 13% job growth anticipated is comparable to the overall growth rate of all professions the BLS tracks. Those who complete an MBA have the most options, both in terms of job choices and salary. One popular choice is operations research analyst. These professionals use advanced mathematical and analytical methods to investigate complex issues, identify and solve problems and make better decisions. The median pay for an operations research analyst in 2012 was $72,100, according to the BLS. Expected job growth through 2022 is 27%, more than twice the typical growth rate for jobs. Then there’s the position of software developer. These tend to be the creative minds behind computer programs. Some develop specific applications, while others develop the systems that run the devices or control networks. A software developer earned about $93,350 in 2012, according to the BLS, and job growth between 2012 and 2022 is projected at a strong 22%. Finally, financial managers are responsible for an organization’s financial health. Job duties include producing financial reports, directing investment activities and developing long-term financial strategies and plans. The BLS reported that financial managers earned a median salary of $109,740 in 2012. Job growth is projected at 9% – about average for all positions. The jobs mentioned above at all levels are just a few examples of what’s available in the business world. Opportunities abound for those wishing to seek information, review their options and move ahead with their plans.